Marikina Life - Life in the City... the City of Marikina. 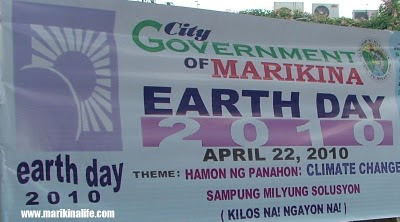 The city of Marikina makes a continuous and conscious effort to do its share of preserving mother earth and one of them is celebrating and participating in the annual Earth Day movement. This year's theme for Earth Day in Marikina is "Hamon Ng Panahon: Climate Change". Several activities were lined up for the entire week. On Earth Day (April 22), there was the Green Exposition at the Riverbanks Center. Also at the Riverbanks Center was the awarding of the 2010 sustainable green acts for mother earth. The awards are given as recognition to individuals, organizations, community association, business establishments, and barangays that continuously work for the welfare of mother earth. On Friday, April 23, the "Todo Linis Hangin" campaign will be launched at the Bluewave Marquinton Mall. This is an anti-smoke belching program which is a clean air & environment project of the city. Also, several recyclable collection events will be conducted around the city. Do you live in Marikina City? Marikina Sports Center, open 24 hours! Happy 18th Anniversary Shoe Museum! Happy 380th Foundation Day Marikina !